Charleston, South Carolina, the second largest city in the country for destination weddings. Voted friendliest city by Conde Nast Traveler, for the years of 2011, 2012,2013,2014 and Travel +Leisure 2013, we are so blessed that our historic city has so much to offer to everyone. For us as wedding photographers in Charleston, Sc, we have a palette of backgrounds to capture images for our clients, we have beaches, marsh lands, barns, and many, many historic buildings. My personal favorite and the one to me that has the most history and architecture look is The Custom House, located on East Bay street and Meeting Street. This gorgeous building built in 1853 that was interrupted from its construction in 1859 then restarted in 1870 and completed in 1879. It was placed on the National Register of Historical Places on October 9, 1974. It is one of the most well made architecture buildings in Charleston, Sc, with large columns, and marble B&W and grey checkered floors, this place is ideal for any engagement, bridal portrait or wedding images. On this day back a few years ago, I had the privilege to capture as I have on many occasions a bridal portrait at The Custom House in Charleston, Sc. 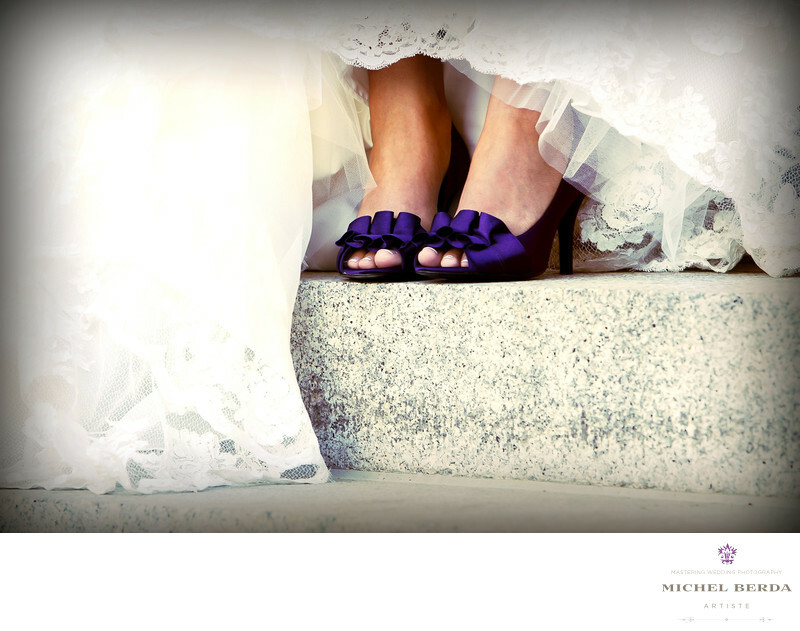 For this image the bride had these amazing purple shoes by a famous designer, she was looking for me to capture them in a different style, quite simply I had the mom who was there to assist us move the dress over to the left and since the stairs of the Custom House, have that grainy marble look to them, I photographed it at a low angle. The result is far better then I expected, and artistically what I was looking to give back to my client. A perfect image.Keywords: Charleston (1179), Charleston Custom House (3), Custom House (12), Custom House Charleston (3), Custom House Charleston SC (3), Custom House Wedding in Charleston Sc (3), Custom House Weddings (3), Destination Wedding Photographer (117), East Bay Street (9), sc (309), Wedding (90), Wedding photographer In Charleston (27), Wedding Photographers (198), Wedding Photography (123), Weddings (168).